Since 1993, client satisfaction has been my priority. I understand that as a homebuyer going through the home inspection process, your hope is that we will uncover only minor issues. While I wish the same for you, your well-being, your investment, and the truth are far more important to me! I entered the home inspection industry in 1993, after nearly a decade of service in construction project management. I have since gone on to complete more than 10,000 home inspections. My extensive experience with residential building structures has provided the opportunity for me to have truly seen and hear it all. If your potential home has defects that can be reasonably found during a home inspection …. I will make it my mission to find them! 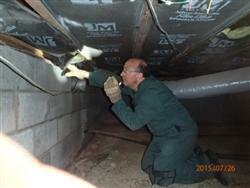 You’re in good hands with me as your inspector, and with the rest of our team at Accurate Inspections, Inc. Hire the home inspector who taught home inspectors! What will you learn from a highly-qualified educator? New Jersey Home Inspector #GI121 (2003, first year licensing was offered). New York Home Inspector #16000011881 (2006, first year licensing was required to 3/08). Credentialed Wood Destroying Insect Inspector (2001). Radon Measurement Technician (1993 present). Commercial Pesticide Applicator (1993 present). Department of Housing and Urban Development Plan Reviewer/Consultant (inactive). American Society of Home Inspectors #102273 (1996 present). Independent Home Inspectors of North America (2002 present). CHAIRMAN, VICE CHAIRMAN & COMMITTEE MEMBER: Appointed to the State of New Jersey Home Inspection Advisory Committee (New Jersey Home Inspection Licensing Board), (2004- present). INSTRUCTOR: “Home Inspector Licensing,” Morris County School of Technology, Denville, New Jersey (2002 – 2005). Instruct students in preparation for National Home Inspector Licensing Examination. Teach 10 hours per week (300 hour course) in all areas of home inspection, including roofing, air conditioning, heating, plumbing, structure, electric, interior, exterior, reporting, professional ethics, standards of practice, New Jersey state regulations. INSTRUCTOR: “For Home Inspector Continuing Professional Competency Courses” by the State of New Jersey (2004- present). OWNER/INSPECTOR: Accurate Inspections, Woodland Park, New Jersey (1993 present). Own and operate home inspection business. Provide home inspections throughout Bergen and Passaic counties, as well as parts of Morris and Essex counties. Inspected over 10,000 homes since 1993. Promote, publicize, and market business to clients and lawyers. CONSTRUCTION MANAGER: Crest Management and Development, Clifton, New Jersey, (1986 – 1993). Coordinate construction of single and multi-family dwellings as well as construction and renovation of commercial and industrial buildings in northern New Jersey. Professional Home Inspection Institute (1993). Saddle River Country Day School (1979). SPEAKER: HomePro National Convention and various local real estate agencies. WRITER: articles on various aspects of home inspection and home maintenance for local newspapers.